Doable Now/Unique Solution Long Term – Rarely is their something completely new, whether a technology, production system, product, service, or method. Rather, entrepreneurs combine old things in new ways, and new places to create new solutions to new audiences. New ideas build on old ones and combine them in unique, new ways. Quality startup ideas balance the do-ability of a new solution near-term with its long-term uniqueness. A startup that will truly scale can’t be a copycat, it must aim to solutions that are unique and represent the target for which copycats aim. Contrarian/Surprise Element – An attractive startup idea has some element that is contrarian. It is treading left while everything else is treading right. Perhaps that arises from the independent-minded nature of entrepreneurs who chart their own course. The contrarian nature of interesting new business ideas also lends an degree of surprise or unexpectedness. The highest impact startups will be something that could not be predicted by most people in advance. The innovations that disrupt an established market will be initially dismissed by businesses that will eventually be put out of business. In 1996, I was involved in a consulting project for Kodak. The Senior VP we worked with dismissed the strategic threat of digital cameras. Kodak was the first company to market a digital camera in the 1990s, but largely ignored the opportunity. Kodak filed for bankruptcy in 2012. How would you apply the Startup Evaluation Matrix to the following early stage agricultural businesses? Which of these business concepts holds the most promise? Why? FarmStockNY, LLC – FarmstockNY is a New York based vertical farm delivering locally grown, premium quality produce using only the best organic practices. We use substantially less resources and can produce 10 times more yield (utilizing patented growing towers) than traditional farming methods. With our proprietary greenhouse and business model we can offer a large array of produce in an ecologically and economically sustainable way at very competitive prices. EndoBiome – Current agricultural practices will be challenged to safely meet the nutritional needs of future populations. EndoBiome was founded to to tap the diversity of the plant microbiome to produce microbial products that increase agriculture. yield and sustainability. Endobiome is differentiated by a proprietary isolation process that yields beneficial microbes and a high-throughput bioassay to identify microbial products that improve root systems. FarmShots, LLC – FarmShots automates the detection of diseases, pests, and poor plant nutrition on farms. We’ve grown rapidly over the past two years- scaling from small farms to more than 300,000 acres across the United States. We’re excited to be changing the face of agriculture as we know it. Farb Guidance Systems – Formed with the purpose of developing, manufacturing, and marketing the next generation of machine guidance technology for agriculture: agricultural machinery that drives itself and can be guided and controlled from anywhere in the world. The technology, in conjunction with the equipment, will increase production and profits, decrease accidents, and help develop regions of the planet un-farmable today. Lean startup is a term coined after being proposed in 2008 by Eric Ries in his book, The Lean Startup. Ries based his ideas on his experiences working in startups, asserting that startups can shorten their product development cycles by adopting a combination of experimentation, iterative product releases, and what he calls validated learning. Ries’ overall claim is that if startups invest their time into iteratively building products or services to meet the needs of early customers, they can reduce the market risks and sidestep the need for large amounts of initial project funding and expensive product launches and failures. Important lean startup principles include the following. Does this methodology play a role in agricultural startups? While software can be an important part of ag startups, often we are dealing with equipment, living organisms, mother nature, and other complexities not faced by a pure infotech startup. In my view, the principles become even more important because of these complexities. My adaptation of minimum viable product is what I term dirty prototypes. What is the most crude prototype you can develop that will enable you test your assertions of value, customer interest, and technical plausibility? Development of prototypes is a powerful means for an entrepreneur to try to avoid pitfalls typical in development of a startup business. However, development of a prototype in isolation from prospective customers can also be an empty exercise. Entrepreneurs need to develop prototypes, but also need to test and evolve them while working with prospective customers. I experienced this, more by accident than design, at my first startup, E-Markets, in 1997. I had developed a very crude prototype for a browser-based application. Ultimately, our first customer pointed at the prototype on projector screen and said they wanted to buy it. But they really didn’t want to buy the prototype. Rather they wanted to buy a much more developed version of the prototype that was highly customized to their needs. During about a 4 month process, we worked daily with the customer and their network of business partners to develop a solution. In the end we had simultaneously developed a much better application, but had also achieved the buy-in of employees of the customer organization and a network of others involved in their business. Prototype development, in the ideal, isn’t a linear process. Instead it’s an iterative process of evolving the prototype or prototype idea based on rich interactions with prospective customers. This interaction leads not just to a better prototype, but to the winning business model that contains the new product and/or service. Developing a prototype while engaging potential customers helps discover and validate the important details of their problems and needs. Most importantly, the engagement process converts those potential customers into real, paying customers. As you develop those paying customers you’ve developed and built a company and business. It’s an example from history, but David McCullough’s book, The Wright Brothers tells a powerful story of using prototypes to move to success. 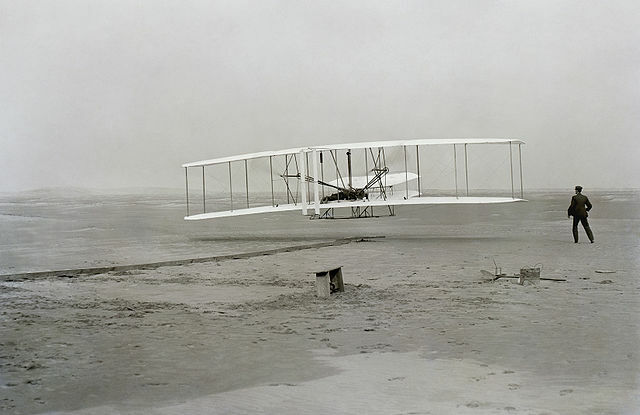 The Wright Brothers gained very little through existing theories or basic research. Rather, they developed the first powered airplane through years of trial and error. Their pathway was through flying kites, carefully watching different kinds of birds in flight, building models, building a wind tunnel, and finally traveling for three straight years from their home in Dayton, Ohio to Kitty Hawk, North Carolina to try their planes. Theirs is another example of theories following invention, not the other way around. The Wright Brothers used some of the mathematical aerodynamic theories that had been developed with their second prototype, but they were wrong and a tremendous frustration to their efforts. Articulate theories on why an airplane works the way it does emerged after the invention. Skipping forward from the Wright Brothers’ first flight in 1903 to 1997, my prototype work was with an Internet-based electronic commerce application. It melded business processes in the agribusiness space with software that enabled new types of more efficient and effective behaviors. Much to my pleasure, I have had Iowa State University students apply similar methods to their products. Colin Hurd at Agriculture Concepts developed the roughest of prototypes while a junior at ISU for what became his Track Till product in 2012. In 2013, prototype number 2 was a much more sophisticated product that has much resemblance to today’s commercial version and got Colin his first sale. In 2014, he sold a more refined product, not anymore a prototype. In 2015, he licensed Track Till to Yetter Manufacturing. Ryan Augustine was senior at ISU in 2012 when he developed the business concept for AccuGrain. The business anticipated using an ISU-patented technology for using X-Rays to measure grain flow. By 2013/14, Ryan had secured the funds and expertise to develop prototype number 1 for AccuGrain. In 2015 he developed prototype number 2, tested it, and now is making his first sales. Clayton Mooney, Elise Kendall, Ella Gehrke, and Mikayla Sullivan developed the concept of a mobile food dehydration unit and formed KinoSol in 2014. They competed in the Thought for Food Challenge, making the finals in 2014, and continued to evolve their product through testing and prototyping. After seven prototypes, KinoSol is today at commercial launch. Prototyping while developing customers is one way that entrepreneurs fail successfully. The only thing you know when developing new product and service concepts, is that they will be wrong. The technology won’t work as envisioned, it won’t have a clear value, it won’t meet the needs of a type of customer, etc. Product successes arise from the learning that happens while interacting with prospective customers who are experiencing use of the new product. Sales is an essential function of the prototyping process, whether in agriculture or any other industry. How may prototyping apply to your business? How can you use a dirty prototype to develop a customer relationship? What Are Young Agricultural Entrepreneurs Working On? ~ Steve Jobs, Co-founder, CEO, Chairman Apple Inc. I ask many friends to serve as panelists and speakers for the entrepreneurship course I teach at Iowa State University, Entrepreneurship in Agriculture. These folks, and others, ask what students in the course are interested in and working on. I suppose the curiosity arises from looking to young aspiring entrepreneurs for creative thinking on new opportunities. This week students in the course will pitch their favorite of the 2 or 3 new business ideas they’ve developed in the course. I went through the list of business concepts to be pitched and categorized them by subject. Most are agricultural businesses, 83%, with non-agriculture businesses in the ‘Consumer Products & Services’ and ‘Social Impact categories the remaining 17%. The top category in the AgFunder report linked to above for 2015 investments was Food Commerce, a category ignored by students. Curious, but local grocery HyVee has started online ordering and delivery, so maybe this isn’t such an interesting spot for entrepreneurs living in Ames. Other top categories of 2015 investment from the AgFunder report line up better with student interest; drones & robotics, decision support technology, and soil & crop technology for example. The students’ interest in animal health and technology relative to 2015 funding certainly reflects Iowa agriculture relative to other areas, heavily concentrated in the animal protein supply chain.